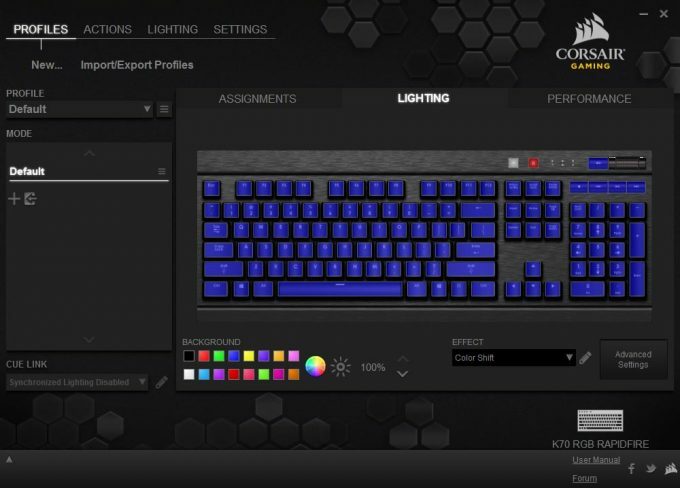 Corsair has really been churning out some fantastic examples of gaming keyboards. It offers a wide spectrum of products to satisfy the needs of even the most serious gamer, including E-Sports teams. Today, we are reviewing Corsair’s most recent offering; a refresh of the K70, now with RGB lighting and all-new RAPIDFIRE switches from CHERRY. I will be the first to admit that it is very easy to get lost in the minutiae of all of the different gaming keyboard choices offered on the market today. In fact, it can be very frustrating. This is really a good problem to have, as over time, due to “natural selection” if you will, keyboards with bad designs or poor features simply die off, and the choices left over are generally very good. 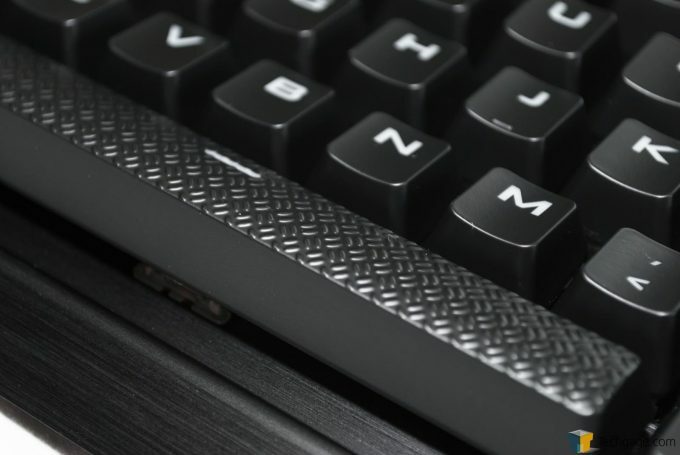 What we are looking at today, is a refresh of Corsair’s very popular K70 keyboard. This new K70 RAPIDFIRE offers RGB lighting, which is a feature every gaming keyboard needs to offer now. The other new feature of this keyboard, is an all-new custom switch from arguably the market leader in keyboard switches to date: CHERRY. In this keyboard’s predecessor, you could choose from CHERRY MX Brown, Blue, or Red (the big three) switches. Here however, the only choice is the RAPIDFIRE switch. Obviously born from the genetic makeup of the Red variety, this switch offers a much faster actuation than that of a standard Red switch. Normally, the Red switch has an actuation point of 2mm, which is generally the same (give or take) with most mechanical switches. This new switch however, the RAPIDFIRE, has a very high actuation point of a slim 1.2mm. In your mind, you may think that .8mm is not going to make THAT much difference, but when you consider that the entire travel of a switch is 4mm, that is a 20% reduction in travel for the actuation point. Does it make that much of a difference? Let’s find out as we take a closer look! This keyboard holds to an aesthetic that I really am a big fan of: less is more. 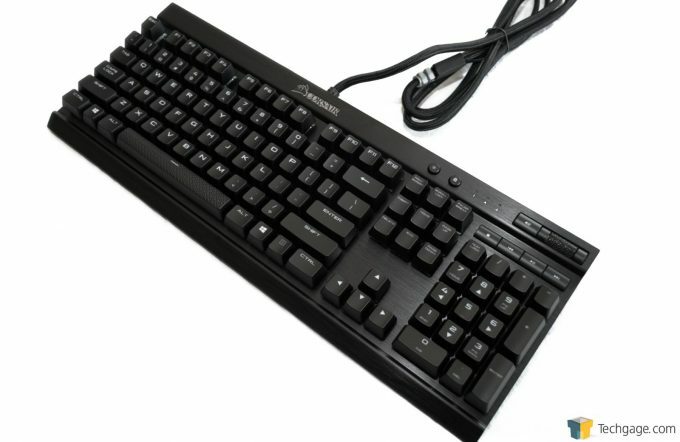 The looks of this keyboard are very unassuming; simple, clean lines, and packed with features. The body of the plank is a flat black, and the top plate of the keyboard is a black, brushed aluminum which looks fantastic. The keycaps are all smooth, with no raised letters or any other nonsense you might find on other keyboards, and the font on the caps is fairly large, too. The spacebar is textured, and I personally find that I like the look, and it feels nice, but I think that I could take it or leave it. I can see some really liking the feature, and others not caring, and some might not care for it at all; it really just comes down to preference. One interesting feature of the appearance of this keyboard, is that you can plainly see the switch structure under the cap. If you are viewing the keyboard from almost any angle other that straight down, you can see the white and clear plastic casing of the switch, which then becomes the color of the lighting color you selected. I personally like the way this looks, especially with the backlighting, it really “pops”. 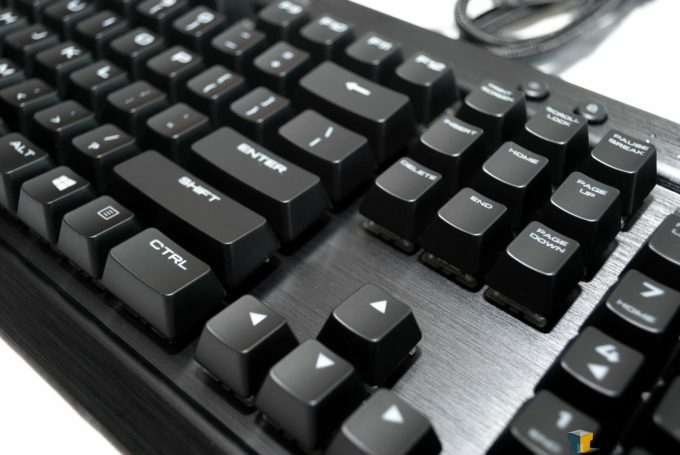 One great feature on this keyboard that some gaming planks omit, is a volume knob and multimedia controls. I really like it when keyboards have volume controls built-in. 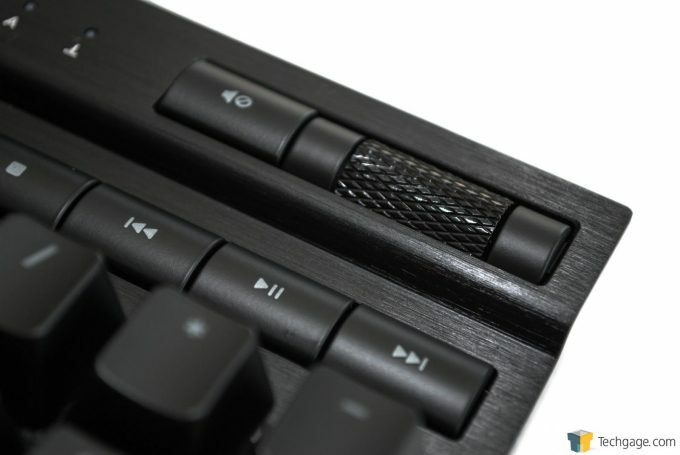 This K70 RAPIDFIRE features a very handsome, knurled aluminum volume knob. I did find the placement a little awkward, as you can’t really leave your wrist on the rest and operate it at the same time. It is placed a little too far north of the 10 keys. On the other hand, the multimedia buttons are in a good place, where you can easily operate them without taking your wrist off of the rest. I also found that this volume knob has a heavier coefficient of friction than I would care for, but I imagine this will loosen up over time. I would not consider this volume knob a deal breaker by ANY means, but I thought it was worth noting. The K70 RAPIDFIRE features a very nice wrist rest, which is a textured material, that feels somewhere in between rubber and plastic, giving it a nice grip feel, but would also be very easy to clean if you spill something on it (let’s face it, we all do). Something I found very interesting (or unusual) on this keyboard, was that there are flip-up feet on the back, AND the front. This gives the user another point of customization. I tried using these for myself, and found it very, very uncomfortable, almost like carpal tunnel was instantly happening, so I flipped the front ones back down and the rear ones up, and I was back to comfortable typing. I really tried to think of a scenario when these front feet might come in handy, but I really don’t understand when you would need them, unless you have an unusual desk, or really thick, unusually placed mouse pad or something. The keyboard features a big fat USB cable with a woven sleeve over it, and is a generous length of about 6 feet, longer than most other keyboards I have encountered. There are two plugs, and you will need to plug them both in to take advantage of the USB pass-through, located conveniently at the top of the keyboard where it will be unlikely to interfere with keyboard operation. Note that while the second USB connector is for the passthrough, you will need both plugged in for the backlight to work on most systems, unless the main connector is plugged into a USB 3.0 port. 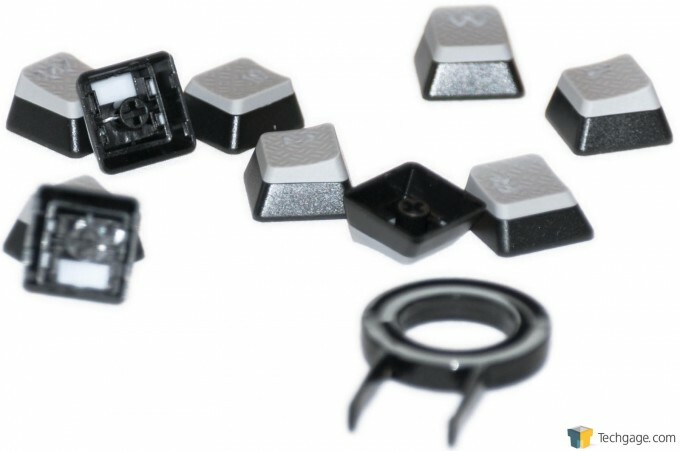 Included with the K70 RAPIDFIRE are FPS and MOBA keycap sets, for WASD and QWERDF, and even includes a handy little keycap puller. 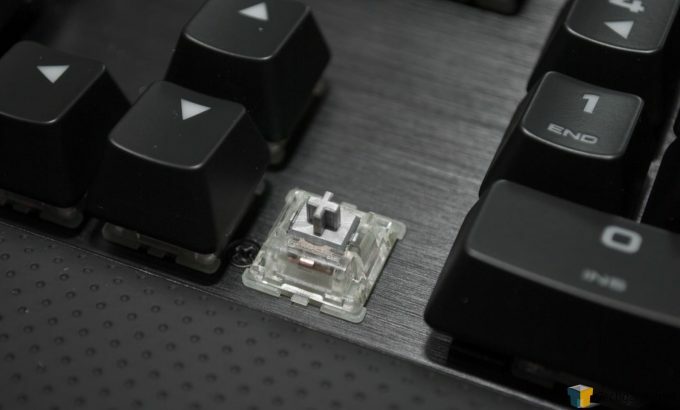 These keycaps are textured and contoured, and are a light grey on top, to really make them standout, making it easier to find your “gaming home row”. As I mentioned earlier, Corsair’s K70 RAPIDFIRE sports a new switch from CHERRY, MX Speed switches. The 1.2mm actuation and the 45g force, make these keys really, really fast. In fact, when I compared it to another keyboard I have with red switches, these were considerably different; no question whatsoever, a noticeable difference. So for gaming where super fast keystrokes are imperative, these switches are a fantastic offering. When it comes to typing, I feel that these switches behave very much like a Red does under normal typing conditions. So if you are concerned about everyday typing, a standard Red switch will give you a very similar, if not the same, experience. Also worth noting, these switches are rated at 50 million stokes, which is absolutely incredible, considering most others are only 5 million. 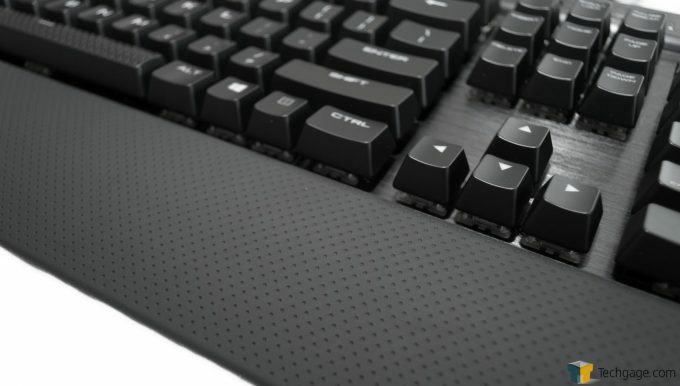 This keyboard promises 100% anti-ghosting and full N-key rollover USB technology. This means, no matter how fast you press the keys, they will all register, every single time; meaning in theory, this keyboard will go as fast as any human can possibly go, with perfect accuracy. I found this to be true, in all the gaming I did, and typing, this keyboard delivered remarkable performance, no complaints here, only sincere praise. There is a small slider switch on the backside of this keyboard, with selections labeled 1, 2, 4, 8, and BIOS. What the numbers indicate, is the report rate. If you wanting to change this, you can choose 1ms, 2ms, 4ms, or 8ms. The BIOS switch is there just in case you need to boot into your BIOS, as this keyboard may not be recognized by all types of BIOS out there. 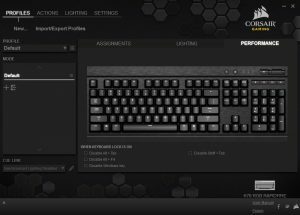 The CUE software (Corsair Utility Engine) has always been a pleasure to use, and this is no exception with this keyboard. This includes all of the basic functionality you would come to expect from a high-end gaming keyboard. And yes, you Dvorak fans, you can remap all of the keys! You can also remap keys to imitate a mouse button or scroll wheel function. Including remapping keys, there is also a Macro mode. You can record various key sequences to form a single macro. One thing worth noting on this keyboard is, there are no dedicated macro keys. If your mouse has a less than desirable DPI shift actuation, CUE has you covered as you can remap a key to enable a DPI shift for “Sniper” mode (with CUE compatible mice). 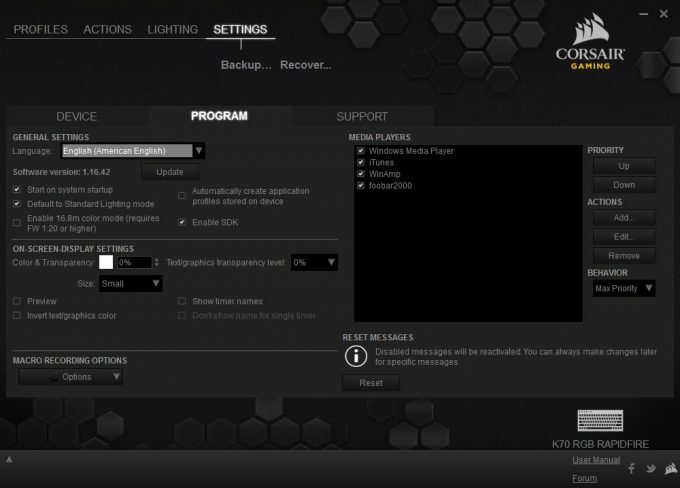 You can also of course control your lighting control in CUE as well. I found the same problem I found in the last keyboard I reviewed from Corsair, that you can’t set just one single static color scheme. The way around this, is to select a color shift, and select the same color for both shifts. 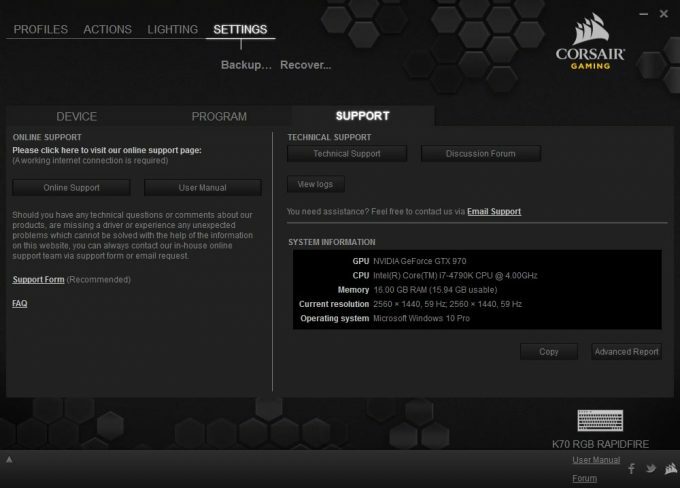 It’s an easy work around, but an oversight on Corsair’s part I believe. You can of course create profiles as intricate as you’d like, and save them on your PC, or store them locally on your keyboards on-board memory. 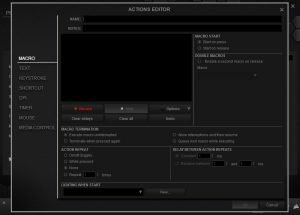 Overall, I found the CUE software to be very intuitive, and powerful, with as many choices for customization as a gamer could possibly want. Limitless Customization thanks to CUE software. Multimedia keys and USB passthrough. Fast/accurate keystrokes thanks to new CHERRY switch.